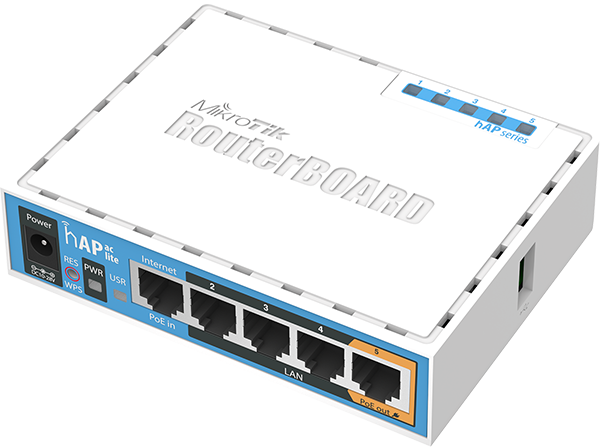 Home :: Mikrotik Desktop Routers :: Mikrotik RouterBoard hAP ac lite RB952Ui-5ac2nD-US low cost 5 port 10/100 switch/router SOHO AP with dual radios - New! Mikrotik RouterBoard hAP ac lite RB952Ui-5ac2nD-US low cost 5 port 10/100 switch/router SOHO AP with dual radios - New! Mikrotik RouterBoard hAP ac lite RB952 RB/952 RB952Ui-5ac2nD-US 5 port 10/100 switch/router SOHO AP with both 2.4GHz and 5GHz radios - New! Mikrotik's new RB952 hAP ac lite, is the wireless SOHO AP and new low cost price leader. It has five Ethernet ports, one USB 2.0 port and two radios with antennas built in. The hAP ac lite radios include a 150mW dual chain 2.4GHz 802.11b/g/n with 1.5dBi antennas and a 200mW single chain 5GHz 802.11ac with 2.0 dBi antenna. This low cost device will look good in any home or office; wall mounting anchor holes are provided. RB952Ui-5ac2nD is available in two versions. The US version is for US and Canada. The International version is for countries outside the US and Canada. NOTE: RB952Ui-5ac2nD-US (USA) is factory locked for 2412-2462MHz, 5150-5250MHz and 5725-5850MHz frequencies. This lock meets FCC requirements and can not be removed. Do not select the lower output 24vdc .8 amp power supply options if you plan on using ethernet 5 as a power source for other products.